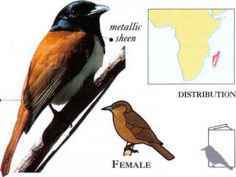 T hinl.y wooded, open country is the main habitat of this shrike. 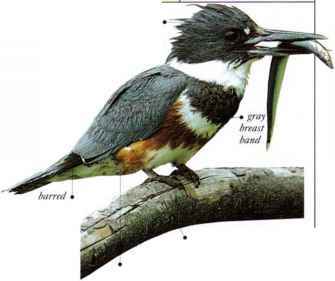 It moves about in short flights from one lookout hooked perch to another, feeding by swooping to the ground to seize prey, mainly insects. • NEST A well-lined, bulky cup nest made of twigs, weed stems, and rootlets placed in a thick shrub or low tree. • DISTRIBUTION From S. Canada to Mexico. Northern populations migrate southward. 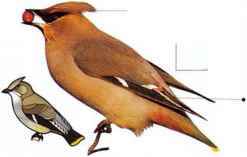 Strictly a rain forest species, the Rufous Vanga is usually seen in family groups of four to eight birds. It is a rather inactive hunter, often spending long intervals watching from a low branch before swooping down to the ground to seize prey. It feeds on a variety of insects but will also take lizards or any similar-size animals. • remark Belongs to a family of birds found only in Madagascar.